Wassup! : Ever feel brand new? Like you stepped outside of who you used to be - and are entirely comfortable in your new skin? That's the way I feel with so many changes taking place. Most have been instigated by me because I want to raise my life game considerably; other changes resulted from my reaction to unexpected events because this determines how I respond to just about everything in the future. I think all the work I've done relating to who I am, how I want to deal with the world - and how I want the world to deal with me - has come together, and I could not be happier. My new "awareness - intention - action!" lifestyle makes a noticeable difference; it influences my perceptions (what's *really* important as opposed to what might feel important in the moment) as well as motivating me to do what I know is necessary and get long awaited tasks done I've postponed all too long. Employing the "broken window policy" keeps me energized. It's the policy that says when you see something that needs fixing, fix it now, don't wait for the one break to become more broken, which is followed by more broken windows showing up, and before long those windows are so broken they need to be be boarded up and the entire area looks unsightly. I still have some catching up to do - but attending to what needs to be fixed steadily, day after day, ends up with a very happy, healed outcome. Basically, it means taking care of the business of life and not letting less important tasks or activities distract me from what's really important - life, heart, home, relationships (human and pet), and making my films. Doing some strategizing of how to get things done and planning what I'll need to have and do in order to implement those strategies is crucial as well. If this sounds rigid, it's not. In fact, it's a way to keep myself open to everything that comes my way so I can make solid decisions based on what I want, rather than feeling torn in several different directions. It's sort of the Aikido of reasoning and decision making. 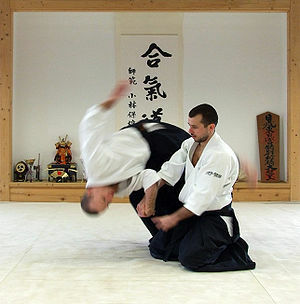 Aikido is a martial art that translates loosely as "the Way of unifying life energy" - it takes very little energy to deal with any attempts an opponent may make to attack because Aikido movement simply helps direct their own negative energy to be used against them. It's going to be such a sensational year, 2010.